1. 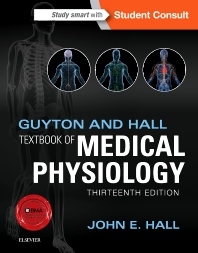 Functional Organization of the Human Body and Control of the "Internal Environment"
The 13th edition of Guyton and Hall Textbook of Medical Physiology continues this bestselling title's long tradition as the world’s foremost medical physiology textbook. Unlike other textbooks on this topic, this clear and comprehensive guide has a consistent, single-author voice and focuses on the content most relevant to clinical and pre-clinical students. The detailed but lucid text is complemented by didactic illustrations that summarize key concepts in physiology and pathophysiology. Larger font size emphasizes core information around how the body must maintain homeostasis in order to remain healthy while supporting information and examples are detailed in a smaller font and highlighted in pale blue. Summary figures and tables help quickly convey key processes covered in the text. Bold full-color drawings and diagrams. Short, easy-to-read, masterfully edited chapters and a user-friendly full-color design.